You can use a dashboard interface with an OpenStack Compute installation with a web-based console provided by the Openstack-Dashboard and Django-Nova projects. Together they provide a reference implementation of a Django site that provides web-based interactions with the OpenStack Compute cloud controller. For more information about the Django-Nova project, please visit: http://launchpad.net/django-nova. These instructions are for a test deployment of an OpenStack Dashboard. They configure your dashboard to use a sqlite3 database and the default Django server. To create a more robust, production-ready installation, you would configure this with an Apache web server and MySQL/Postgres database. 1.To build a reference dashboard you must use the two projects together. Here are the overall steps for building the dashboard. 2.Get the source for both django-nova and openstack-dashboard. 3.Optionally, build django-nova with the bootstrap script and build-out commands as shown. 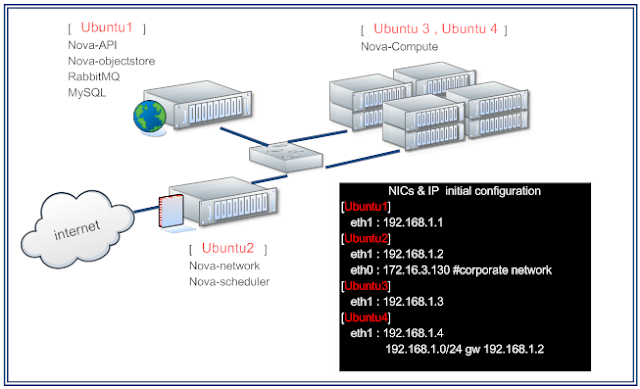 4.Build and configure the openstack-dashboard. 5.Create the openstack-dashboard database with the syncdb command. 6.Run the server that starts the dashboard. Before you begin, you must have bazaar installed. It's straightforward to install it with sudo apt-get install bzr. Next, get the source for the django-nova project. This project contains the code for the website. If you see a message saying "You have not informed bzr of your Launchpad ID..." you can ignore that if you do not want to make changes to the code for now. You now have a directory named trunk containing the reference implementation. You now have a directory named trunk containing the dashboard application as well as code for the look and feel. If you want to develop upon or modify the inner workings of django-nova, you'll want to build this reference implementation. If not, proceed to building the OpenStack Dashboard itself. These two commands (bootstrap.py and buildout) install all the dependencies of django-nova. If you find that virtualenv is not installed, you can use easy_install virtualenv to install it and then re-run the python command. Now that the virtualenv is created, you need to configure your local environment. To do this, create a local_settings.py file in the local/ directory. There is a local_settings.py.example file there that may be used as a template. You configure local_settings.py in the next section. Now you can configure the dashboard application. The first step in configuring the application is to create your local_settings.py file. An example is provided that you can copy to local_settings.py and then modify for your environment. NOVA_DEFAULT_ENDPOINT : this needs to be set to nova-api instance URL from above. You can use 'http://localhost:8773/services/Cloud' if you plan to view the dashboard on the same machine as your nova-api. NOVA_ACCESS_KEY : this should be the EC2_ACCESS_KEY in your novarc file (which includes the project name). NOVA_SECRET_KEY : this should be the EC2_SECRET_KEY in your novarc file. If you are using an admin user that is named something other than "admin", add the following two options to the local_settings.py file. In this example, the admin user is named "osadmin". One additional option is available in the local_settings.py file, the default region. This can be set to anything, but is set to nova by default. easy_install installed, use sudo apt-get install python-setuptools. This step takes some time since it downloads a number of dependencies. Once this configuration is complete, you should be returned to the prompt with no errors. If you get 403 errors, it probably means the user is undefined. Check the nova-api log file (typically /var/log/nova/nova-api.log) for specifics. Make sure that your firewall isn't blocking TCP/8000 and just point your browser at this server on port 8000. If you are running the server on the same machine as your browser, this would be "http://localhost:8000".